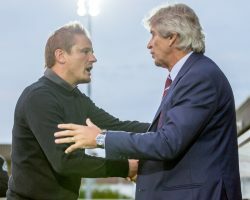 Premier League West Ham were forced to come from behind against the excellent 10 men of Wimbledon – recording a 3-1 victory to progress to the third round of the Carabao Cup. 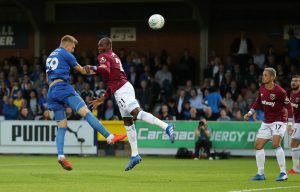 Issa Diop, Angelo Ogbonna and Javier Hernandez netted second-half goals, cancelling out Joe Pigott’s header for the Dons – who had Rod McDonald sent off early on. There was a sense around the Cherry Red Records Stadium before the game that the Dons could pull off an almighty upset, and that feeling was elevated when Pigott gave Neal Ardley’s side the lead within two minutes. 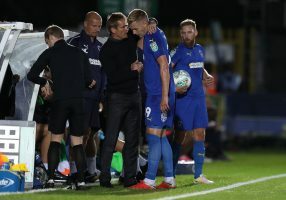 AFC Wimbledon manager Neal Ardley speaks to Joe Pigott after he is substituted during the Carabao Cup, second round match at Kingsmeadow, London. PRESS ASSOCIATION Photo. Mitch Pinnock’s set-piece delivery has been superb since his summer move from Dover Athletic, and it was his corner that the former Charlton forward met to head into the top corner. But the magnitude of Wimbledon’s task against this strong Hammers side was to be made even greater on 17 minutes when they were reduced to 10 men. McDonald had already been booked when he pulled Hernandez to prevent the Mexican from meeting a cross and was subsequently sent off. 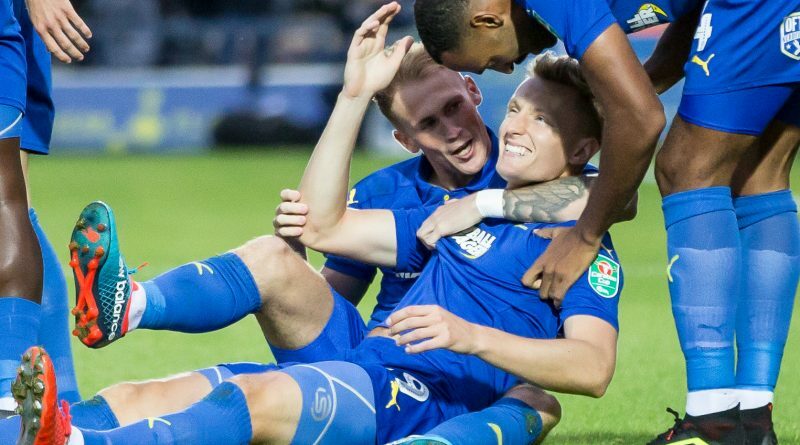 AFC Wimbledon’s Joe Pigott scores his side’s first goal of the game during the Carabao Cup, second round match at Kingsmeadow, London. PRESS ASSOCIATION Photo. 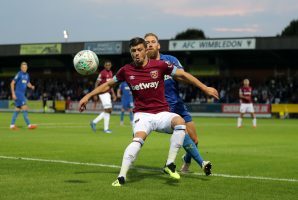 West Ham United’s Aaron Cresswell and AFC Wimbledon’s Scott Wagstaff battle for the ball during the Carabao Cup, second round match at Kingsmeadow, London. PRESS ASSOCIATION Photo. The visitors began to take advantage of their numerical superiority, the front three of Hernandez, Lucas Perez and Andriy Yarmolenko finding more space – but barely managed to test Dons goalkeeper Tom King. They had their best chance late in the half when Yarmolenko looped a header goalwards, but youngster Toby Sibbick was on hand to clear from underneath the crossbar. 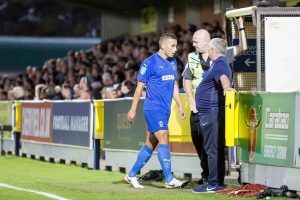 James Hanson was immense in the first half as a lone striker following Pigott’s withdrawal as Ardley reshuffled his side in the aftermath of McDonald’s red card. His battle with West Ham defender Diop was fascinating, with the former Bradford man more than matching the ex-France U21 international. West Ham dominated in the second half and the game was effectively played in Wimbledon’s third of the pitch. The Hammers constantly pressed, coming close through substitute Felipe Anderson’s long-distance drive, but the Dons held on for the first 15 minutes of the second period. Hernandez should have equalised on the hour mark but somehow guided Yarmolenko’s low cross wide from six yards under pressure from Scott Wagstaff. But the Hammers did eventually level the scoreline two minutes later – Wimbledon uncharacteristically gifted Diop too much time to drive forward and unleash a powerful effort into the corner of King’s net from 25 yards. The centre-back almost turned the game around moments later, smacking the crossbar with a header, and the visitors had all the momentum against the tiring, yet industrious hosts. Hanson almost netted a rare Wimbledon attack on 70 minutes, but mistimed his header from Tyler Garratt’s cross. West Ham continued to threaten, Robert Snodgrass had a shot deflect wide and it was from the resulting corner that they netted the winner. Aaron Cresswell’s inswinging corner was poked home from close range by Ogbonna – but Deji Oshilaja was unlucky that the ball came off him on its way in. 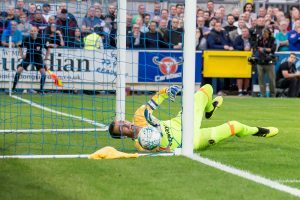 It gave the Dons a monumental job of at least forcing a penalty shoot-out. And it was a task they fail to complete, Hernandez culminated a free-flowing counter-attack by rounding King and tapping in. However, against all the adversity, the red card, the superior quality of the opposition, this was a valiant effort – and one they can take confidence from as they search for a first league victory since the opening day.